Plans to build two new settlements near Istanbul will help provide safer housing for the city residents living in earthquake danger zones, Prime Minister Recep Tayyip Erdoğan said in televised remarks Wednesday. The “two new cities” planned by his ruling Justice and Development Party, or AKP, will also provide better access to services and make traffic lighter within Istanbul, Erdoğan said, adding that moving to the new settlements would be completely voluntary. According to the government’s plan, one of the new cities will be built in largely uninhabited mining areas along the Black Sea coast on Istanbul’s European side, where the risk of earthquakes is lower. The other will be built on the Anatolian side of the city. Each settlement will then have a population of about 1 million. Istanbul is bisected by the Bosphorus Strait, which marks the geographical dividing line between Europe and Asia. 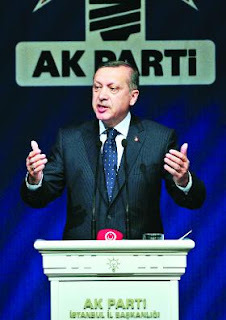 Though the party is using the term “two cities” for the plan, the proposed settlements would be built as new extensions of Istanbul rather than constructing two separate cities, Erdoğan said. He added that socioeconomic inequalities in Istanbul and the Marmara region as a whole would be reduced by this project, which would also strengthen transportation infrastructure by connecting existing highways to each other and to the proposed third bridge across the Bosphorus.